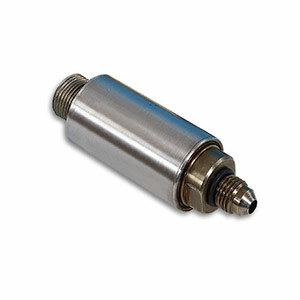 OMEGA’s PX1005 Sputtered Thin Film Pressure Transducer was designed for cryogenic service; it can operate in temperatures from -196°C to +149°C (-320°F to +300°F.) Yet, even in these difficult temperatures, it provides outstanding accuracy, long-term calibration stability and reliability. Static accuracy is ±0.25%, and thermal zero and sensitivity shifts over the compensated range of -196°C to +27°C (-320°F to +80°F) are less than ±0.01%/°F. The all-welded stainless-steel pressure cavity and double-isolated case ensures reliability in the tough environments normal to cryogenic service. OMEGA’s thin film technology makes this premium performance possible. The strain gages are sputter-deposited, forming a molecular bond with the substrate. There is virtually no shift, drift, or creep to cause the transducer’s calibration to change. OMEGA’s PX1005 is available in many standard ranges from 15 psi to 1,000 psi. A calibration record is supplied with every unit. Sensing Element: 4-active-arm bridge using sputter-deposited thin-film elements. 注: Some discoloration of the pressure connection and surrounding area may occure due to the hot/cold calibration of this product.